See what I did up there? Playing with words is one of my favorite past times. But in all truthfulness, these pancakes really will replace all other notions of what a pancake should be once you make them. And because this is my second post in a row about pancakes, I hope that you will trust my advice and make these tomorrow morning. It is so incredibly cozy and foggy in Los Angeles right now; so cozy that I woke up just in time for lunch and decided to make a big batch of pancakes. I love when weather surprises you a bit. It’s nearing the hottest months of summer down here and almost without warning, this beautiful city has wrapped itself in a sheath of clouds and nodded it’s pretty little head encouraging you to curl up and spend the day reading. I listen to my city. After a nuts, dusty, laugh-filled birthday weekend, I am more than okay to slow things down a bit and play around in my kitchen. All weekend we dined on some of the most inventive, delicious vegan food I’ve ever had. Lydia’s Organics set up shop at Lightning in a Bottle Festival and we made it our jobs to eat there at least twice a day. We trekked miles upon miles each day through art installations, sound baths, dance parties, and pop-up vendors but always made sure to stop by Lydia’s to fuel up. I’m still dreaming of the curried cauliflower, teff flour wraps, and almond hummus that I doused in sriracha each day. We were all so pleased to have access to healthy organic food in the midst of all of the dust storms and late nights. Isn’t it all about balance? These pancakes are inspired a bit by that idea of balance. I am not normally one for adding sweeteners to my dishes, but in this particular case, the addition of a swirl of agave atop the half-cooked cakes adds an incredible crispy texture. It’s something I used to do when making pancakes as a kid, but with white refined sugar. Never a good idea. Unlike refined processed white sugar, agave nectar has a much lower glycemic index. This means that where white sugar spikes your body’s blood sugar with a resulting sugar crash and an insulin spike, agave nectar does not. When our bodies release too much insulin, it results in weight gain and can put you at risk for a myriad of diseases. Agave nectar contains the same type of sugar found in fruit called fructose which when ingested, does not cause the same blood sugar spike. In a high speed bender, pulse the almonds until they resemble small pebbles but not to the point that they become almond butter. In a large bowl, whisk together the ground almonds along with the rest of the dry ingredients, set aside. In your blender, thoroughly combine the almond milk, vanilla, eggs, and banana. With a fork, blend the wet ingredients into the dry. The batter will be lumpy and not too runny. In a non-stick skillet coated in coconut oil over medium heat, pour and flatten about 1/4 c of batter. Atop the pancake round, drizzle a tbsp of agave around the center of the cake. When the batter has begun to fuse together and bubble a bit (they won’t bubble like regular pancakes because of their weight), use a spatula to flip it over and continue to cook the other side. Do this with the remaining batter – yields about 4 pancakes. 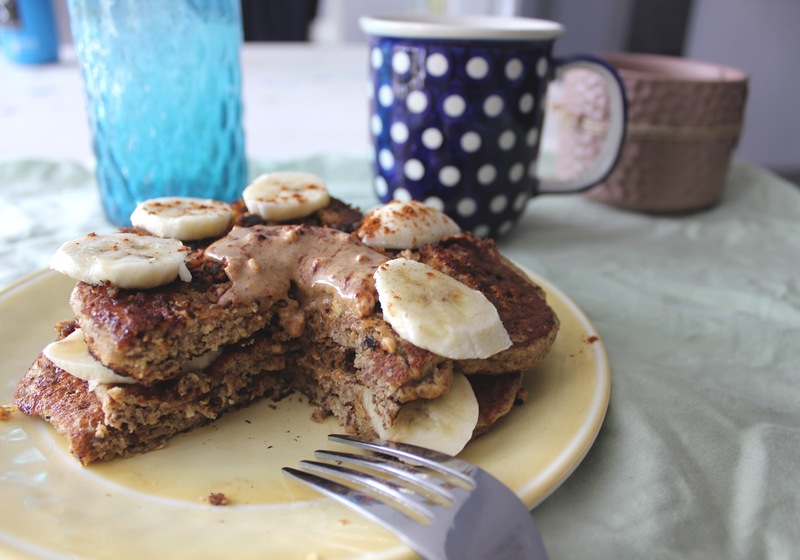 Top up on a plate with sliced bananas and almond butter and cinnamon and eat!